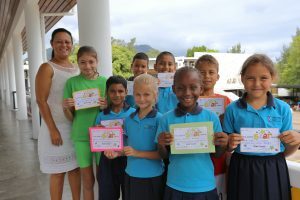 The eight Junior stars of this week were nominated for excellence in Maths, spelling, writing great similes and metaphors, singing, taking great care of their personal belongings and showing commitment to their studies. As the eight youngsters conversed with the Principal over Juice and snacks they shared dreams of how they wish their future to be. The Principal reassured them that dreams are essential to have so they can work towards achieving those. They left the office happy with the thought that they can change their dreams as they grow up as long as they have dreams to guide their life.